The pristine beaches and stunning limestone scenery of southern Thailand have made it a favourite backdrop for Hollywood movies, such as “The Beach” and of course James Bond's “Man with the Golden Gun”, and you’ll feel like you are on a movie set riding through this gorgeous landscape. Southern Thailand has more to offer than turquoise waters, white sand and lush jungles - it’s also home to a fascinating mixture of cultures. Thai Buddhists mingle with Muslim seafarers to produce a colourful people steeped in history and tradition. Priding themselves on their openness and hospitality, the people of the south, or Khon Dai, are always ready to show “farang” (foreigners) their country. 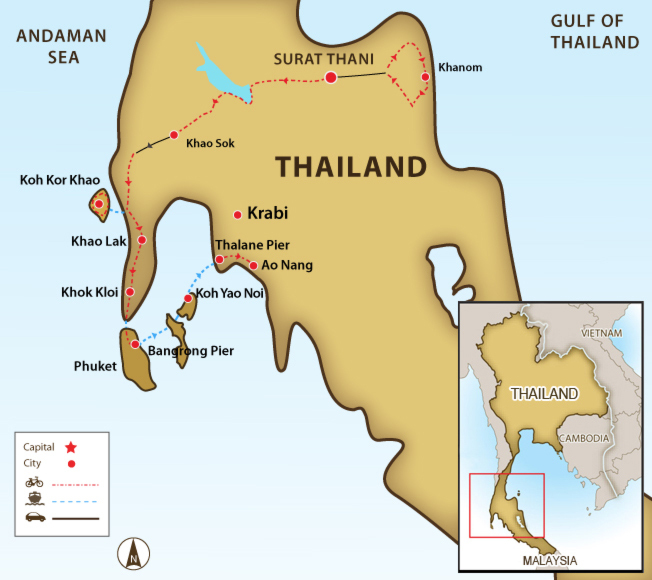 Our tour starts on the Gulf of Thailand, at a pristine beach that is off the tourist track. We then head inland and spend time on a stunning lake and ride on the edge of Khao Sok National Park - home to the last of Thailand's great rainforests - before we head to the beaches on the Andaman Sea. From Khao Lak we'll head to the paradise island of Koh Yao Noi where you'll spend time with a local fishing family. As we boat through Phang Nga Bay towards Krabi be awed by the spectacular limestone cliffs rising vertically from the sea. Though we ride through the world class tourist destinations of Khao Lak and Krabi, we also leave behind the tourist enclaves and see a Southern Thailand that is a rarely visited gem to be discovered. 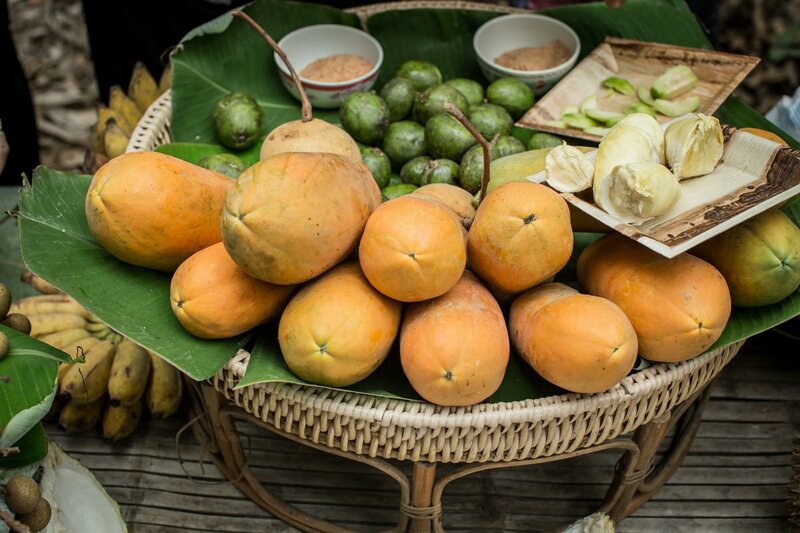 You are met at Surat Thani Airport by our team and transfer for lunch before riding on quiet, shady country roads to Khanom Beach. We loop along the coast, past some stunning beaches, through a fishing village to a cave, and stop off at a refreshing waterfall on our way back to the hotel. We ride 20 km and lunch at Singkom Cave Temple before getting back on the bikes and ride towards a pier for an afternoon boat ride beneath towering karst cliffs on Cheow Laan Lake. We ride downhill for a fast start before a windy and undulating road leads us through a series of magnificent limestone cliffs and green jungle along the edge of Khao Sok National Park. We'll ride through the old town of Takua Pa as we cycle towards the ferry to Koh Kho Khao Island, stopping en route to visit the Tsunami Victim Cemetery. A free day to relax with a planned afternoon exploration of the mangroves by boat. We cycle to the Tsunami Memorial and see the big fishing boat that was carried 2 km inland by the waves. We head inland and take a quiet back road as we cycle to Sai Rung waterfall for lunch and a dip. We ride backroads to our next seaside resort. We catch our boat to Koh Yao Noi island and explore this paradise island before reaching our overnight. We cycle to the pier and catch our boat to the mainland where we cycle to Krabi. Morning free before onward travels. Day 1 - Arrive in Surat Thani Ride 40km. +246m / -251m. Great experience from beginning to end, beyond my expectations. From the pre-trip communications up to the very end of the trip it was a terrific way to see Thailand off the beaten path with an experienced guide who was a wonderful tour leader. On a personal level, I would like to say that all the pre-trip communication with Gems was fantastic; very thorough, patient and professional. I felt if this is an indication of the company, I'm signing up for the tour! Then, Nat, our guide, was simply terrific. Kind, knowledgeable, friendly and enthusiastic. He made every day of the trip a pleasure and really was at the core of my great experience with SpiceRoads. Mr Pong, the driver, was there in the background, always helpful and kind, with a smile. In short, the staff was first rate and really made my first trip with SpiceRoads a very successful one in my eyes. Loved every minute of it. Overall it was an awesome trip (our second) and we will not hesitate to recommend the company to others and probably look at a third tour. The route was great and your guides and drivers are superb. It would be great to see a Spice Road team at the Phuket triathlon. It was a great experience. We enjoyed how the tour started through the rural villages of Surathani Khanom the jungle resort etc etc. and finished in Aonang Krabi. This gave us good time to relax and enjoy more food and do personal shopping. The guys really showed us the Thailand cuisine, the aromas, flavours and colour were exceptional! To top that all off they even got us to try the sweets, which we all enjoyed as well. Other things we enjoyed were seeing the rubber plantation, the monkey up the tree getting coconuts and the elephant rides. The guides really showed us what Thailand has to offer, the food, the culture and richness of the country! We cycle 384 km exploring beaches, waterfalls, jungle, fishing villages, and islands. We enjoy some time off the bike, so we can take in boat rides, wildlife, and the culture of this fascinating region. The cycling is on a mixture of tarmac and dirt roads. An air-conditioned minivan that travels behind the group provides excellent support. Participants can cycle as much or as little as they like and still enjoy the same views as the rest of the group. Our route is designed to take us off the main roads as much as possible, so we can explore scenic areas around Khanom, Khao Lak, Phang Nga, and Krabi. On this tour, there is one dedicated full day off and a couple of morning rides, so you have the afternoons free to enjoy the beach. Suitability: The riding is primarily on tarmac roads, with a few undulations, but there are no major hill climbs. The distances are well within the capability of most riders with a reasonable fitness level. Biking Conditions: This trip is a mixture of good-condition tarmac roads and vehicle-wide dirt roads. A small amount of riding is off road, but nothing too technical. A support truck is always available to help when required. We are met at Surat Thani airport by our team and transfer for less than an hour before we have lunch at a restaurant. Then it’s time to start riding. We take a quiet, shady country road through a rubber tree plantation as we head to our beachside resort on Khanom Beach. We do a loop ride along the coast, past some stunning beaches, through a fishing village, to a cave. We head back to the beach for lunch before we head to a refreshing waterfall on our way back to the hotel. We’ll be riding through an area that is missed by most tourists, so don’t be surprised at the reactions you get from the locals at seeing a foreigner on a bicycle. We leave the waves and sand behind and transfer for two hours before starting to cycle. We ride 20 km before we stop for lunch at Singkom Cave Temple. Back on the bikes, we cycle towards the pier, where we meet our boat for a ride beneath towering karst cliffs to our floating accommodation on Cheow Laan Lake. Our bamboo bungalows are simple, but clean, and have the unique feature of being able to dive directly into the lake for a swim. If there's time before dinner, go for a sunset kayak to try and spot monkeys. After waking up to the sounds of the jungle, we take the boat back to the pier and our waiting bikes. We start our day with a downhill and then take a road that undulates and winds through a series of magnificent limestone cliffs and green jungle along the edge of Khao Sok National Park to our riverside lodge. Khao Sok National Park is one of the true hidden gems of Thailand. The park consists of evergreen rain forests, huge limestone mountains shooting straight up in the air, as well as isolated lakes, immense caves, and a plethora of wild animals. Our ride today will take us to the outskirts of Takua Pa. We ride through the old town and see traditional wooden buildings intermixed with Portuguese colonial buildings as we ride towards our ferry to Koh Kho Khao Island. We visit the Tsunami Victim Cemetery, which memorialises the victims from 39 countries. The short ferry ride brings us to an island oasis, and we’ll ride the short 6 km to our beachfront resort. A free day to relax and enjoy the endless beach. Feel free to take the bikes and explore the island. In the late afternoon, we’ll go on an exploration of the mangroves by boat. We cycle from the hotel to the ferry pier, and then it's a short ride to visit the beachside Tsunami Memorial at Ban Nam Khem and the big fishing boat that was carried an amazing 2 km inland by the surging waters. Smaller boats were also deposited nearby, particularly in a pond we’ll pass. We then head inland and take a quiet backroad through small villages, shady rubber plantations, and river crossings as we cycle to the small waterfall of Sai Rung. There’s a dipping pool at the base perfect for cooling off before we have lunch. Then it’s a short cycle to our hotel in Khao Lak. We ride backroads, along canals, past palm and rubber plantations and shrimp farms, and along the beach to our next seaside resort. It's an easy riding day, so you have time to enjoy the pool at your deluxe hotel. This morning we transfer to Phuket to catch our boat to Koh Yao Noi Island. Once on land, we explore this paradise island before reaching our overnight at a homestay with a local fishing family in their traditional home. In the evening, we head to the night market and try some local favourites, including roti. This morning we ride to the pier where we catch our boat for the 45-minute ride through karsts back to the mainland. Once on land, we ride through palm plantations, pineapple fields, forests. We’ll be towered over by stunning limestone cliffs as we cycle to Krabi. Morning free. In the afternoon, we will arrange airport transfers for anyone who needs them. Anyone who would like to stay longer should contact us for hotel rates. Because some people can't imagine going on a trip without their own beloved bicycle, we do not provide them as part of this tour. However, you can hire bikes locally for the price listed in the tour pricing section. The bikes are well-known makes of hybrid or mountain bikes (depending on the tour) with lightweight alloy frames, 24- to 27-speed gearing, v-brakes, and Shimano components and front suspension. If you bring your own bike, please make sure it is a mountain bike, preferably with front suspension, in good mechanical order. Southern Thailand has a tropical climate with fairly high humidity. There are three seasons: from March to June it is hot and dry, with temperatures between 27˚C/ 80F and 35˚C/95F and, with night temperatures in the 20s. The rainy season is from July to October, but temperatures are slightly lower, because of the effect of the rain. During this time it will not rain continuously, but in sharp bursts, and the sun can come out quickly. The cooler season is from October to February, with average temperatures between 20˚C/68F and 30˚C/86F.